This is the section devoted to Fortune Cookies! What are they? It's simple : a fragrant cookie which, in line with Chinese tradition, has a piece of paper inside. And what is on this piece of paper? Phrases, small pieces of truth and wisdom. Opening a Fortune Cookie is always fun, as well as useful! In fact, Fortune Cookies can give you the right advice at the right time. Give it a try! Open your Fortune Cookie! Fortune Cookies were invented by Makoto Hagiwara, right back in 1909. Since then, Fortune Cookies have spread all over the world, thanks to their originality. Opening a Fortune Cookie has always been a fun activity, especially amongst your closest friends. It can also be a way to exchange truth and wisdom, maybe after dinner or having a nice of tea! Fortune Cookies will be able to give you the right advice exactly when you need it. You can share a phrase or piece of wisdom with whomever you want! Fortune Cookies are fun to open, but also to make! And this is why Ching Oracle gives you the real recipe for your homemade Fortune Cookies, to open with your friends! After softening the butter, whisk the egg whites and gradually add the caster sugar, the sifted flour and the vanilla extract. Place the mixture onto a baking tray, using a spoon to swirl out the mixture into small circles. (Bake for 3 minutes in a 180C oven). Take the biscuits out and place the fortunes you have prepared in the centre of each cookie, close them, put them back in the oven for a further 30 seconds, take them out and form the classic fortune cookie shape. Finally, set aside to cool. 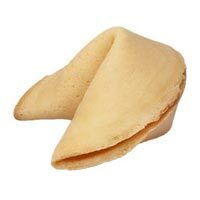 Fortune Cookies contain a good luck message, to share with whoever you wish and whenever you want. Ching Oracle however suggests various other ways to bring you luck. Why not try using the Feng Sui Talisman? You will find luck in every corner of your house!